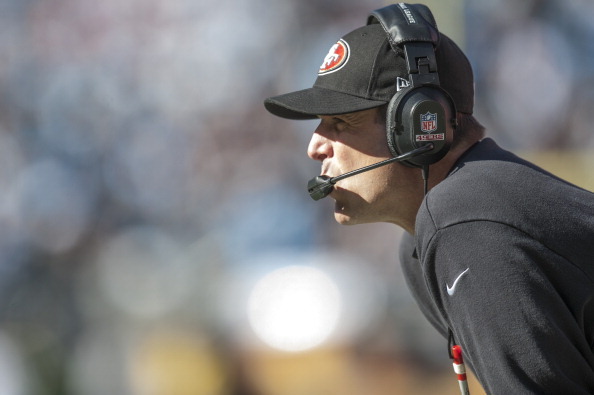 Will The Tension In San Fran Lead To Harbaugh Moving On? It was the most compelling, as well as stunning story to come out of the NFL Combine this past weekend. A head coach who has taken his team in his first three seasons to three NFC Title Games reported to be on the trading block, going from the Penthouse in San Fran to the NFL outhouse that is the Cleveland Browns. So why was Jim Harbaugh dangled out there as a possible new coach of the Browns? 49ers owner Jed York stepped in Monday, stating that the Niners want to keep Harbaugh, and that the club had ‘no interest’ in doing a coach for draft picks deal. York talked with the Sacramento Bee, and did admit that the Browns called about Harbaugh, but the Niners said they dismissed the deal quickly. As for the Browns, they hired Bills defensive coordinator Mike Pettine, who at this point has to feel like like a girl who found out she was a boys fifth choice to go to prom. The latest story from Harbaugh is that there’s tension between he and the front office, and that he and General Manager Trent Baalke don’t talk, and just trade emails. Is Harbaugh that toxic that after three trips to the NFC Title Game and one Super Bowl that the team would rather part ways with him? York told the Bee that the Niners want to secure a long-term deal with Harbaugh. “We want Jim to be our head coach, and we’ve said that very clearly,” York told the paper. If that’s the case, York had better step in and figure out why there’s this major communication issue between Harbaugh and Baalke. If not, consider Harbaugh a lame duck coach entering the 2015 season. That’s not good for business – nor for the product on the field with a coach looking for his next gig. Be the first to comment on "Will The Tension In San Fran Lead To Harbaugh Moving On?"